The most common citrus fruit used in gin. Distillers use lemon rind to impart the distinctive, citrus aroma. 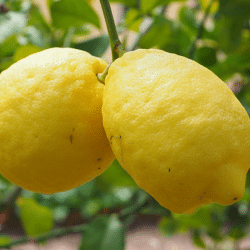 Native to Asia, the lemon has been known to Europeans since the first century AD; however, European cultivation didn’t become common until the Renaissance period. Like Gin, lemons were sometimes carried on 18th century Naval vessels. Navy Strength Gin for the officers’ private enjoyment, and lemons to prevent scurvy among the officers and crew.